Home / The 30 Things List / Happy New Year, 2017! Published on January 3, 2017,	by KT in The 30 Things List. I just went back through my last few posts and it seems like this blog is mostly a collection of my year end wrap-ups. That’s not what I envisioned, of course – this was supposed to be a travel and adventure blog. But you know what? I forgive myself for that. And I love this blog anyway. It’s a good reminder of how I’ve felt as the years have passed and it’s a great opportunity for reflection. So I love it the way it is. That’s going to be my intention for 2017: LOVE. Instead of doing new year’s resolutions, I try to set an intention for the year. What better for 2017 than the intention to love more? For one thing, the wedding is coming up in September and it will be a celebration of all things love. Our love for each other, for our families (by blood and by choice), for travel, for food, for everything. Our passport-style Save the Date cards! Designed by me with help from a friend who also made us custom passport stamp magnets that were attached to the inside. I’ve put in a ton of work already and there’s so much left to do, it’s overwhelming. We’re still looking for vendors and I’ve somehow talked myself into hand-painting 15+ globes for centerpieces. Did I mention I’m planning to do the cupcakes myself? Honestly, planning this thing has been painful for me. I’ve had to face the fact that I’m not really a wedding person, that I’m not what society says a bride should be, and that what I want isn’t necessarily going to meet everyone’s expectations. I haven’t enjoyed the process so far… but that’s over in 2017. I’m determined to love planning our wedding. I will find joy in the process, the research, the fine details. I’ll have fun with the crafts and the shopping. I plan to laugh off the problems and shrug off the stress. And I know I’m going to love the final product because it will be our wedding and, when it’s over, I get to spend the rest of my life with the very best person I know. 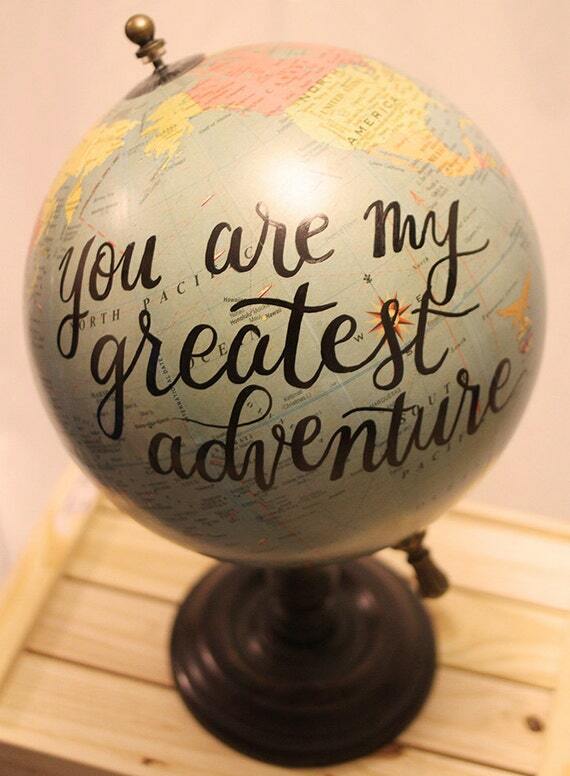 An example of the globes we’re making for our centerpieces. Image from Pinterest, courtesy of Etsy. But the theme and intention of LOVE extends beyond the wedding. Especially now, when the world feels so full of hate, I think it’s important to focus on love. To remember it exists, that we’re all worthy of it, and that it’s something that takes effort. During the election last year and in political conversation in general, I notice a real lack of empathy and understanding. What would happen if we could love each other through that? What would happen if we could truly empathize with the other side, see their value, and understand their perspective? We’d be so much better off. The country needs love right now. And, ultimately, I want to love myself more. That means cutting myself some slack on being perfect, forgiving myself for my shortcomings, and being proud of my achievements. I’m going to love my body, at least enough to take care of it the right way. I’ll practice loving where my life is at, every day, even when it’s difficult or depressing. I will spend more time loving my friends and family. Love is what will battle back the voices of anxiety and insecurity, build my confidence, and help me succeed. Most of all, it will make me a better partner to Tim, a better friend, and a happier person. I love you, 2017. Let’s do this.